In early fall 2004, Merce Cunningham, then 85 years old and still actively looking for a new creative challenge, began working on an adaptation for the proscenium stage of Views on Camera, an existing dance for camera he had developed that summer with collaborator Charles Atlas. 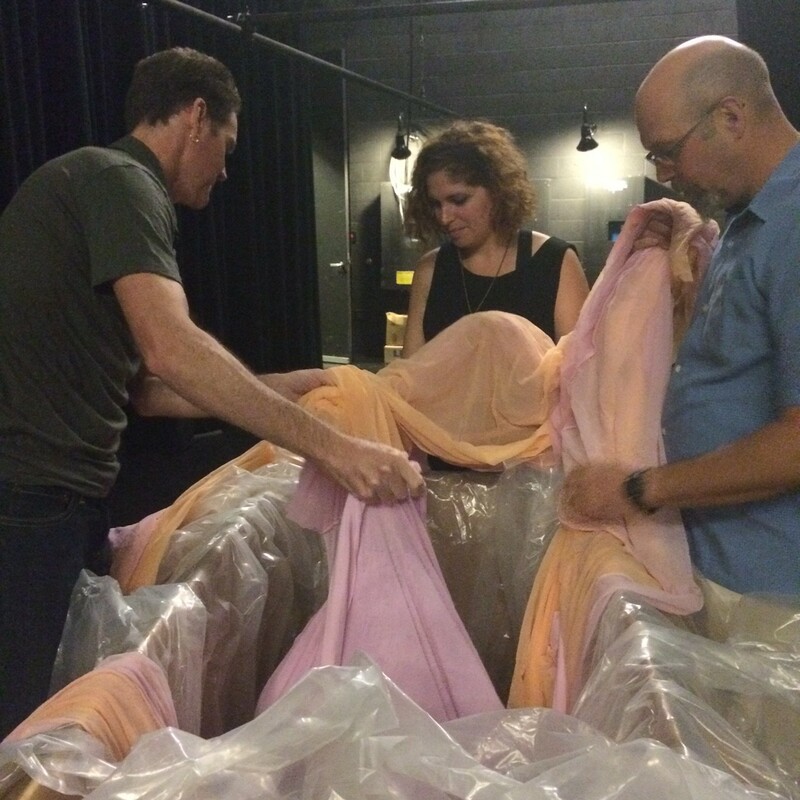 The new work for stage, aptly titled Views on Stage, consisted of a similar choreographic structure, but was visually redesigned by costume designer James Hall and Brazilian artist Ernesto Neto. Upon the invitation of Merce Cunningham Dance Company manager Trevor Carlson and Cunningham, Neto was given the opportunity to expand his design into a wholistic environmental experience, complete with theatrical lights and an eerie score of two John Cage compositions, ASAP (As Slow as Possible) (1985) and Music for Two (1984). Entitled otheranimal, Neto reconsidered a form he had imitated for his contribution to the 49th Venice Biennale in 2001, a horizontal nylon scrim stretched loosely over the ceiling from which hung “socks” of glass beads, rice and pellets. For Neto, the fabric was the skin of a body, the porous barrier between inside and outside, and at once the inside of a living body. Biomorphic, malleable and amoebic, otheranimal appears to be a organism as much as a set design, one that could melt, drip, fall, or embrace the dancers beneath it. Neto’s sculpture is at once foreboding and playful, suggestive of a primordial cave, and bringing to mind the soft sculptures of artists such as Claes Oldenburg. 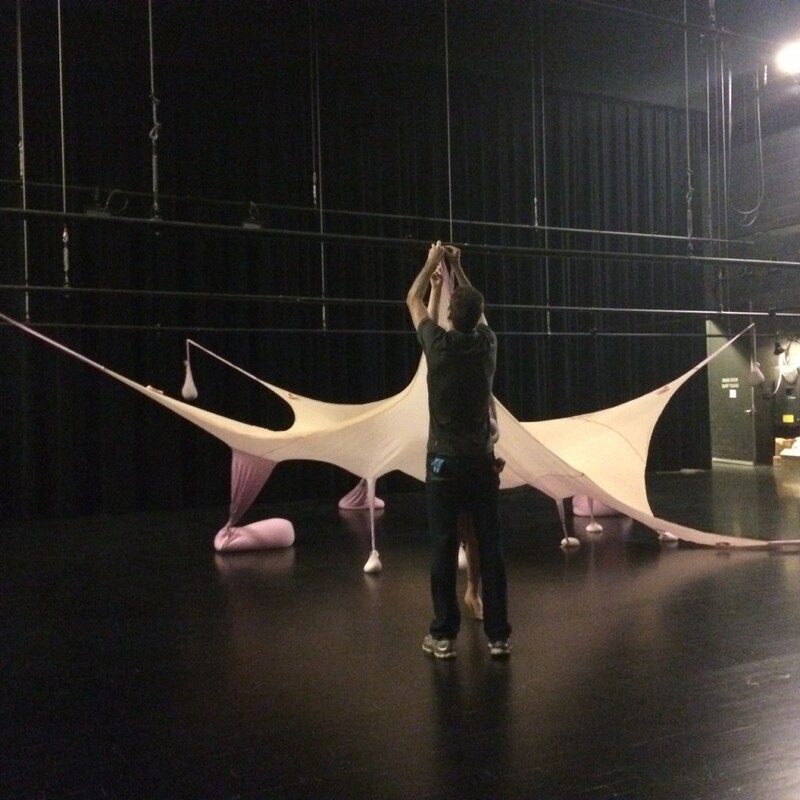 In preparation for the February 2017 opening of Merce Cunningham: Common Time, we installed the complete work earlier this month in order to share notes on how to adapt this stage décor into a gallery installation. 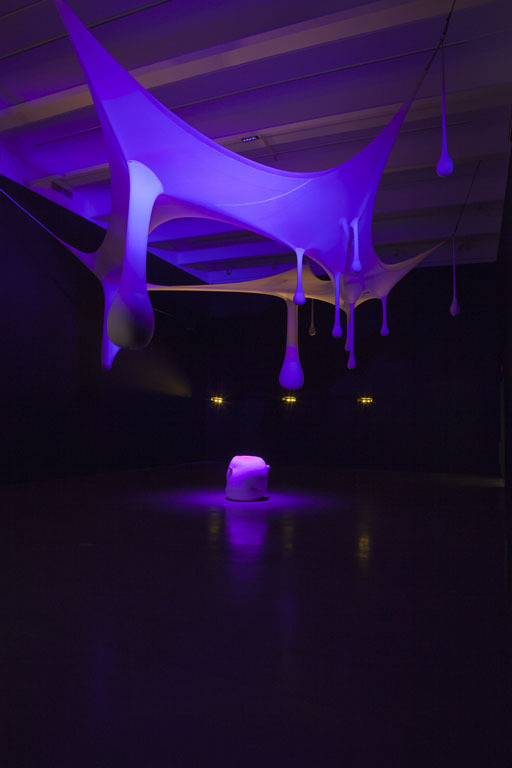 (It was last on view in the 2012 research exhibition, Dance Works II: Merce Cunningham/Ernesto Neto.) Joining our registration and theater technical crew was Rebecca Fuller Jensen, an expert lighting designer who set to work on re-programming the lighting plot based on the dimensions and light pollution concerns of the gallery space, where otheranimal will be exhibited. Jenson and the stage crew carefully plotted the exact dimensions of the gallery onto the McGuire Theater stage floor, and determined the exact location for each point of the hanging décor. Otheranimal was intended to hang from theatrical line sets, and its installation is determined by a plan in relation to lights that traverse the ceiling above, allowing light to shine directly down into the center of the decor, permeating the material. Once in place, Jensen went to work, translating the relationship of Neto’s original design onto the more compact installation. The artist’s lighting plot makes the installation appear to change color from pink to orange, to white, blue, and green. Over 11 minutes, the lights gradually change color, generating a calming glow. Neto’s “egg”—a soft sculpture of lightweight pellets—sits at the center of the piece, and constitutes an orientation point for the dancers during the performance Views on Stage. After two days of work, the decor was re-folded in its box (always considering the constant touring and mobility of the company, Cunningham’s instruction to Neto was that the décor be able to fit into a small packing crate). Even with the walls of the theater exposed, and without Cage’s score, otheranimal had transformed the theater into an alien landscape. The stage is a place constantly under transformation, shifting from one world to the next. Bringing this aspect of fantastical transformation and illusion into the gallery an important element to all the preparations for Merce Cunningham: Common Time. Ernesto Neto’s otheranimal décor for Views on Stage will be on view at the Museum of Contemporary Art Chicago’s presentation of Merce Cunningham: Common Time, opening February 11, 2017.